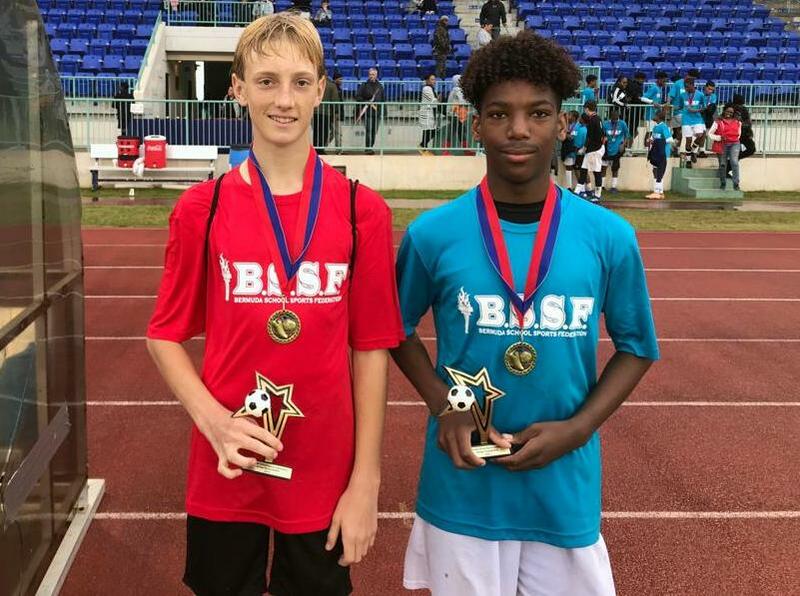 Three matches were postponed due to inclement weather, but three matches went ahead as the Bermuda School Sports Federation’s All-Star Weekend continued with Football at the National Sports Center. The East came from behind to win a thrilling match when the day finally got started. Sandy’s forward Kieron Richardson gave the West the lead midway through the first half after calmly collecting the ball inside the box before placing his shot in the far corner leaving the East goalkeeper with no chance. Kenori Simons equalized for the East within minutes of the second half after he scored from his own rebound. The Whitney player turned provider in the dying minutes of the game when he laid the ball for Aquiyei Richardson from Dellwood who placed the ball home to secure the victory. The west pressed forward but East goalkeeper Nick Kempe from Somersfield provided several key saves to ensure the victory for the East. Warwick Academys midfielder earned MVP honors for the West while Dellwoods defender Kristian Cherrington was named MVP for the East. The West exacted revenge after losing on penalties in last year’s edition by scoring all five of their penalties in easily the most exciting match of the day. The West came from behind on three occasions through three fine efforts from Berkeley’s Jadae Steede Hill. The east took the lead when CheChulae Dowling from Chatmore Academy followed up on Saltus’ Danni Watson’s cross. The West was on level terms after Steede Hill steered home a cleared ball from 25 yards. The East regained the lead in the second half when Saltus’ Noah Autmezguine headed the ball home from a Asrael Basden cross. Steede Hill scored immediately after on the restart, she caught the East goalkeeper off of her line and scored from the halfway line on the restart. The East would once again when Saltus’ Emily Cabral drove into the box and drove a shot past the West goalkeeper. Once again Steede Hill pull her team on level terms when she scored from 30 yards leaving the East goalkeeper with no chance as the ball found the far corner of the net. Both teams exchanged penalties before Berkeley goalkeeper Terrinae Trott stopped the final effort from the East to give the West the win. The West secured a comfortable 3 - 0 win over the East in the Senior School Boys game. Two first half penalties sent the West well on their way to victory. Jenico Sealey from Berkeley gave the West the lead after he picked himself up off the floor to convert the first penalty. Minutes later a East defender handled the ball inside the box to give the West another penalty. This time Berkeley’s Jeze Butterfield stepped up the steer his spot kick home. Bermuda Institute forward Armand Foy scored the lone goal in the second half for the West. Sealey was named MVP for the West, while Ryan Lopes from Mount Saint Agnes was named MVP for the East.